Gorgeous, Stunning and worth looking, this Glass Candle Holder with Gift Box is a classy piece to hold. The unique design and shape, makes its distinct from rest. 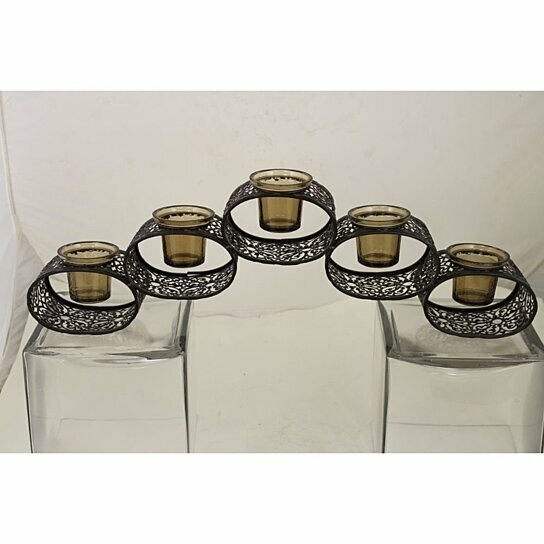 The five votive candleholders inside oval metal ring look spectacular. It can be considered as a centerpiece to be displayed on the dining table, center table or on mantel. On a romantic dinner night, this candleholder will add beauty to the setting. Nowhere can you find this piece, this candleholder will lighten up any ambiance with its presence.